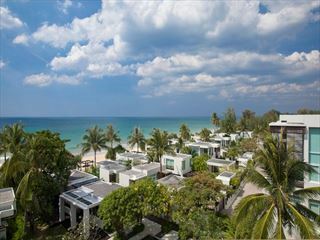 Centara Grand West Sands Resort & Villas Phuket is located on the west coast of Phuket and set in 47 acres of land with 500 metres of pristine beach frontage on Mai Khao Beach, the longest and quietest stretch of beach on this side of the island. The resort has been designed to blend in with its ecologically sensitive environment, and has its own green systems that ensure the natural resources of the area are conserved. The design focus of the resort is an extensive water park with swimming pools, a lazy river and waterslides, including a huge Super Bowl slide. All rooms, suites and villas are of modern design and are carefully sited to take advantage of the stunning views of the Andaman Sea and Phuket’s dramatic hinterland. 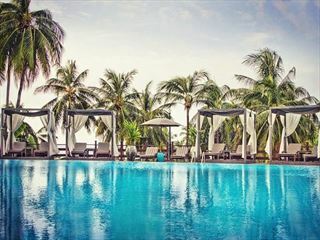 Although this part of Phuket is renowned for its extensive areas of natural and undisturbed beauty, the resort is only 15 minutes away from Phuket International Airport. Deluxe room has an area of 65 square metres and is ideal for couples or individuals. A full-length window offers views either of the garden, sea, pool or the water park, and many rooms have a furnished balcony. Featuring signature twin beds, this unit can accommodate up to 2 adults and 1 child. Every room is equipped with spacious private bathroom, flat-screen TV with international satellite TV. Deluxe Suite 1 Bedroom has an area of 70 square metres, with a spacious living and dining area, fully-equipped gallery kitchen, and bathroom with a Jacuzzi. The balcony overlooks the gardens, sea or the swimming pool. Featuring signature king bed, this unit can accommodate up to 2 adults and 2 children OR 3 adults and 1 child. Each suite is equipped with flat-screen TV with international satellite channells. Deluxe Family Suite 2 Bedroom has an area of 135 square metres and is a combination of Deluxe and Deluxe Suite 1 Bedroom units joined together by interconnecting door. Featuring a king size bed and twin beds, this category can accommodate up to 4 adults and 1 child. Mai Khao Beach is everything that a Phuket beach should be. There are long, gorgeous, unspoiled stretches where it’s possible to find total seclusion, with not a single person, shop, bar or restaurants in sight. Part of Sirinath National Park, Mai Kaho Beach is enormous, at almost 10 kilometers long, making it the longest Phuket beach. Untouched white sand bears testimony to the distinct lack of development at Mai Khao Beach. If you have come to Phuket in search of an unforgettable beach, don’t waste your time at Patong Beach, as for too many tourists do. 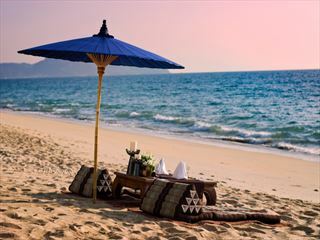 Just head to Mai Khao Beach and enjoy the isolation.